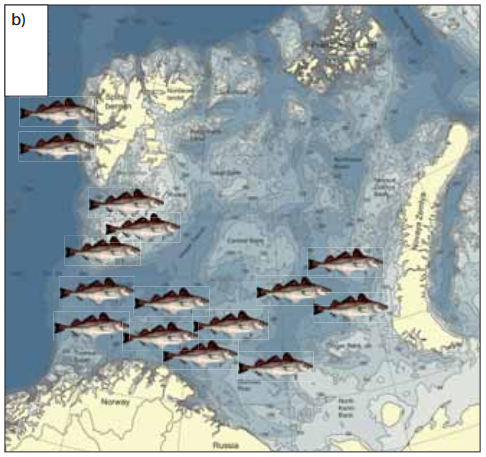 As sea ice declines, new opportunities for high sea fisheries are emerging. The Arctic has significant stocks of living marine resources, which are some of the most productive in the world. Regional fish populations are changing. The Bering Sea in particular contains numerous fisheries including halibut, shrimp, scallops, squid, Pollock, crab, cod, pacific salmon, capelin and many more. The 2001 total wholesale (raw fish landings) value for groundfish harvest in the eastern Bering Sea was approximately $426 million. 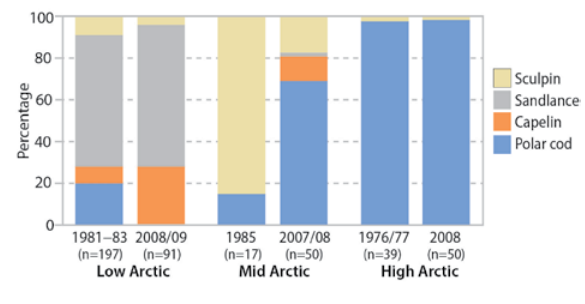 Climate change may have varied impacts on Arctic fisheries. Factors such as water temperature, changes in ocean current, and competition for food could affect the rates of growth, mortality, and spatial distribution of commercial fish stocks. Some species may disappear, and many others may appear in areas they were not originally found. This may create new fisheries as old ones are lost. 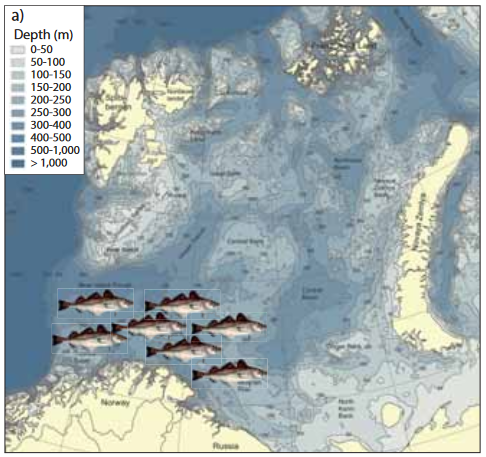 Cod distribution in the Barents sea, last century and now. Migration and distribution patterns will likely change, impacting the catch in specific regions. Studies have shown that warming could improve the cod, herring and Pollock stocks. High seas fisheries management practices must be improved in order to avoid depleting these economically and environmentally important resources.